The District of Columbia Public Library (DCPL) is the public library system for residents of Washington, D.C. The system includes 25 individual libraries including Martin Luther King Jr. Memorial Library (the central library). The library was founded in 1896 by an act of Congress after a lobbying effort by Theodore W. Noyes, editor of the Washington Evening Star newspaper. Noyes served on the library's board of trustees for 50 years. The first library branch was located in a home at 1326 New York Avenue NW. This was replaced by a main library, donated by Andrew Carnegie, built at Mount Vernon Square, which now houses the Historical Society of Washington, D.C. President Theodore Roosevelt attended the dedication of this building in 1903. Several of the branch libraries still in use were also built with funds donated by Carnegie. In 1972, the main library was replaced by a Ludwig Mies van der Rohe-designed building dedicated as a memorial to Martin Luther King, Jr.
DCPL is an independent agency of the District of Columbia municipal government, managed by a Chief Librarian that is selected and reviewed by a Board of Library Trustees. The Board of Library Trustees are appointed by the Mayor of the District of Columbia, subject to review and approval by the Council of the District of Columbia. The budget is also determined by the Council of the District of Columbia based on a request submitted by the Mayor as part of the annual budget process for the entire municipal government. The United States Congress also has to approve of the District's budget as a part of their oversight of the District of Columbia as the nation's capitol. The Chief Librarian is often invited to attend the Mayor's Cabinet meetings and works closely with the City Administrator on how to execute the DCPL budget. The District's Chief Financial Officer provides a fiscal officer from that office to ensure that financial practices within DCPL meet with District requirements. DCPL also has independent procurement authority, allowing them to execute contracts for books, electronic resources, furniture, equipment, and construction services. In addition to the Board of Library Trustees, the Council of the District of Columbia provides oversight for DCPL via a Council Committee on Education. The DC Council routinely has Performance Oversight and Budget hearings for the D.C. libraries annually. 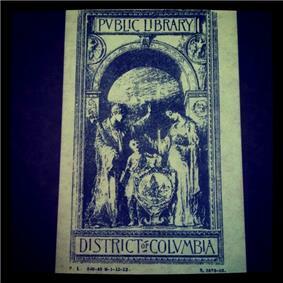 Pre-1923 book plate for the DC Public Library. Public libraries in Washington, D.C.
^ "About the DC Public Library". District of Columbia Public Library. Retrieved 2011-07-22. ^ a b "Mission & History". District of Columbia Public Library. Retrieved 2009-11-28. ^ "DC Government Web site". District of Columbia. Retrieved 2011-07-22. ^ "DCPL Web site". District of Columbia. Retrieved 2011-07-22. U2, Washington, D.C., Ludwig Mies van der Rohe, National Register of Historic Places, Martin Luther King, Jr.